Fans of Outdoor Shows will recognize Team Realtree Outdoor’s logo on the bright orange can that I found perched on the grocery store shelf. Blaze Orange is the name of the flavor and the camouflaged can is bright enough to be seen at night. But if I didn’t review the drink, then who would? So I made the purchase and carted my new beverage back to my deer blind hoping I’ve found a prize buck. Back at my abode I notice two things. First the can is made with thick plastic, a seemingly good choice for someone who might drop it from their perch in a tree or other high place. Of course the thought does cross my mind that perhaps the heavy durable plastic may also be resistant to buck shot, but since I live in a heavily populated area I won’t be testing that hypothesis. The second thing I notice is that the top is difficult to remove. I should say it’s difficult for me to remove, but perhaps for an outdoorsman who is used to working with his hands this would be a cinch. After a few muscle exhausting moments I finally remove the top. No discernible scent is present. That is a good thing. So I take a gulp. A mild lemon-lime flavor washes through my mouth like a tornado though a trailer park. It actually tastes good. I eagerly take another sip hoping for the best. The same results are produced. The carbonation remains strong and I can’t help but admit that I am pleasantly surprised. 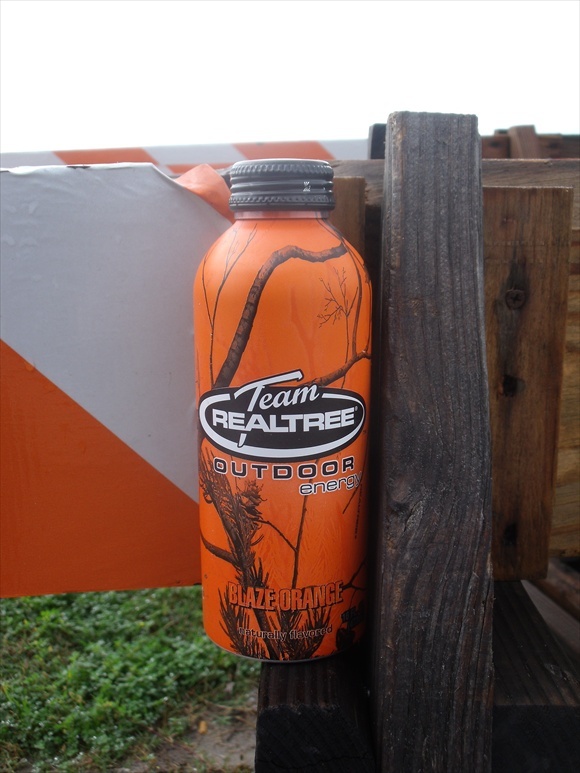 Team Realtree Outdoor Energy Blaze Orange has a decent flavor and doesn’t leave an after taste, not too bad if you ask me! So I finish the bottle happy that the over-the-top orange label caught my eye. Final Review: Buy a bottle! If you need some pep in your hunting step, grab a can of Team Realtree Outdoor Energy Blaze Orange, it’s buckshot of decent taste at a decent price.